Yes, there is a time and a place for perfectly coordinated china, with place settings all in one pattern, color-coordinated accessories, and everything all formally matched. 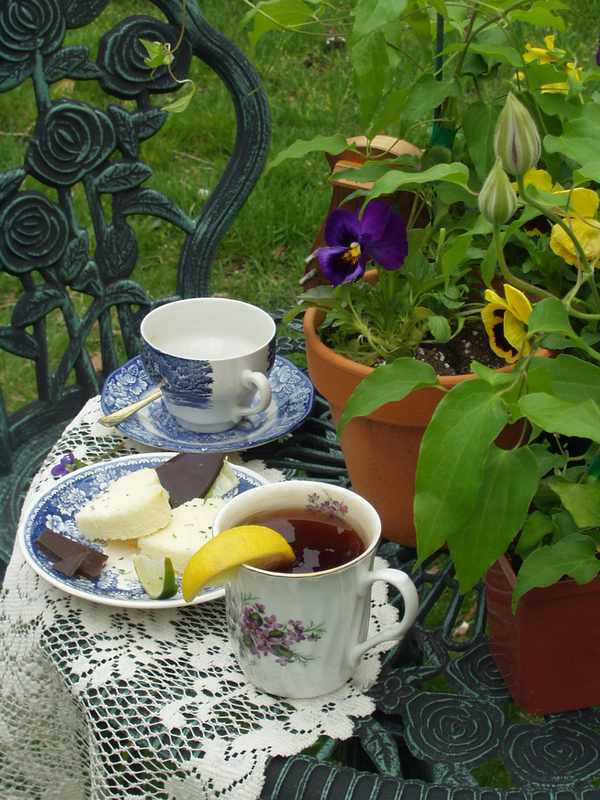 But for a casual tea here in Grace's Garden -- and indeed, for any of those quiet, relaxed moments when you just want to enjoy an informal cup of tea -- it's great fun to mix and match your china and accoutrements! Here, two different blue-and-white patterns, "Old North Church" from Liberty Blue's Historic Colonial Scenes, and Mason's Ironstone Blue & White (made in England for Crabtree and Evelyn), sit happily alongside a creamy white bone china mug decorated with delicate violets and gleaming gold accents (Violets, by Salem China). Variety is the spice of life! Many tea rooms today serve guests using mixed place settings, and the different colors, patterns, and styles add to the unique experience. So have some fun -- mix up your china, try interesting combinations of tea treats, and by all means, indulge yourself now and then by trying a brand-new variety of tea! Untold treasures are just waiting to be discovered.... and they're as close as your teacup!